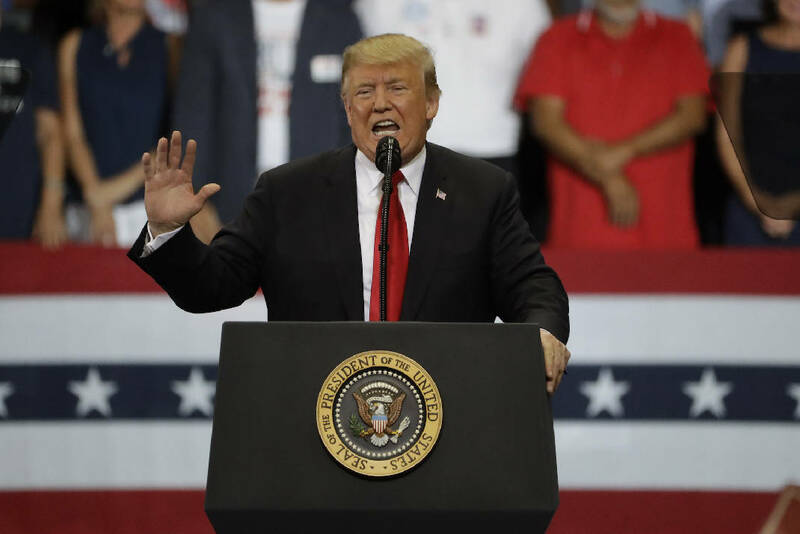 Donald Trump is holding 10 rallies over five days before the midterm elections. How bad do you think it's going to be? We really need a rest. The country's been through a terrible streak of terrorism — the pipe bombs followed by the mass shooting in Pittsburgh. And the president has been worse than useless. His rhetorical high point came when he went to the synagogue where 11 people were murdered and didn't say anything. The bottom was the moment when he blamed the temple for failing to post armed guards at its religious services. In between he's been busy going to rallies for Republican candidates and failing to rise to the occasion. Hours after the temple shooting, Trump was already back before his howling supporters in Illinois. To be fair, he began by speaking about "the hateful poison of anti-Semitism" and the need "to renew the bonds of love and loyalty that hold us all together as Americans." He pursued this theme for six minutes. That was it. Then he lapsed back into his beloved Size of The Crowd mode. (" I hate to say it, but outside you have a group that's almost as big or just as big trying to get in.") On Wednesday it took only a minute and a half for Trump to move from "unity and togetherness" to "the far left media" being "the enemy of the people." Trump is absolutely driving home the fact that he is not going to improve his act in honor of a crisis. In Illinois, egging the crowd on, the president suggested he might "tone it down just a little bit" in honor of the worst anti-Semitic assault in recent history. "No!" cried the audience on cue. "I had a feeling you might say that," the leader of the free world said happily. The worst thing about the rallies is that he keeps coming back to immigration, even though recent events have made it crystal clear that this is poisoning the nation. We know now that both the alleged pipe bomb-maker and the synagogue shooting suspect were obsessed with immigrants. It's the place where Trump becomes an abettor in the right-wing, white nationalist violence that's torturing the country. And he's capable of doing better. A little. It's insane to expect him to lift up the nation. But is it too much to ask that he just stick to the non-violence-inducing themes in his repertoire? He loves to remind his fans that he won the election, and that's a safe topic. Maybe he could devote half an hour of every rally to his theory that it's harder to win electoral votes than the popular vote. Plus crowd estimates — he could spend some time claiming that 47 percent of the entire population of Fort Wayne, Indiana, was standing outside the door, in terrible weather, just to watch him on closed-circuit television. Then there's the mysterious promise of a 10 percent tax cut known to no one in Washington but Donald Trump. And the dropping of the name of Hillary Clinton so the audience can yell, "Lock her up!" More than one commentator has noted how ironic it is that the guy who spent his Kavanaugh period endlessly repeating "innocent until proven guilty" is so into this trope. Also, we could point out the recent Times story about the president's wild irresponsibility when it comes to having conversations on his private cellphone. But no, we're not going there. What do we want him to say that isn't dangerous? Well — preferably without specifically attacking Clinton, Maxine Waters or any other pipe-bomb recipients — he could talk about the things the Republican majority did over the last two years. OK, that would not fill up nearly an hour. Instead of just announcing, as he always does, that "this is the greatest political movement in the history of our country," he could claim it's the greatest in the history of the planet. And compare himself to Thucydides or Winston Churchill or Pope John Paul II. Honestly, it'd be such a relief.